When I started my Kentucky Derby 2016 contenders list on September 30, Mohaymen was my top ranked horse and three months later he finishes 2015 on top of the heap. Mohaymen is a perfect-3-for-3 and is spending the winter in Florida. He returned to the worktab at Palm Meadows on Dec 31 and is expected to make his next start in the Holy Bull Stakes at Gulfstream Park on Jan 30. This is what my first list looked like on 9-30-15: (1) Mohaymen, (2) Seymourdini, (3) Mor Spirit, (4) Ralis, (5) Street Vision, (6) Sail Ahoy, (7) Conquest Big E, (8) I Will Score, (9) Justin Squared, (10) Greenpointcrusader, (11) Brody’s Cause. As you can see, eight of my original eleven are still part of the list including my current top five (Mohaymen, Mor Spirit, Brody’s Cause, Greenpointcrusader, Conquest Big E). In November, I posted a video about Kentucky Derby Pool 1 future wager and suggested playing Conquest Big E, Greenpointcrusader, and Sail Ahoy. For the first ever sire wager, I said to play Bernardini, Eskendereya, and Giant’s Causeway. We will see how all of that plays out next spring. Latest Workout: 4f in :49.45 (36/76) at Palm Meadows on Dec 31. Comments: The $2.2 million yearling purchase beat promising $900k purchase Seymourdini at six furlongs in his Belmont Park debut on 9-19-15 (87 BSF). In the G2 Nashua on Nov 4 at Aqueduct, he stalked wide, took a clear lead in the stretch, and won nicely by 1.75 lengths (89 BSF) under a hand drive. He wrapped up his juvenile campaign with an effortless stalk/pounce win by 1.5 lengths (96 BSF) in the G2 Remsen at Aqueduct on Nov 28. He retains the top spot, returned to the work tab Dec 31, and might make his sophomore bow in the G2 Holy Bull Stakes at Gulfstream Park on January 30. Comments: $650k purchase had a slow start, made a nice inside middle move, took the lead, and ended up a clear 2nd (83 BSF) in his 6f Santa Anita debut Sept 27. He returned at a flat mile Oct 23 and cantered to an easy win (92 BSF) as the 1-2 favorite (geared down under Gary Stevens). He shipped to Churchill Downs and battled hard throughout in a good runner-up performance in the Kentucky Jockey Club Stakes on Nov 28. He wrapped up his fine juvenile season with a win in the G1 Los Al Futurity on Dec 19. He stays put at #2. Latest Workout: 5f in 1:02.65 (7/8) at Palm Meadows on Dec 28. Comments: Put it all together from off the pace in a strong 4-1/2 length victory in the Champagne. I really like his pedigree and he figures to get better with age. The BC Juvenile favorite was too far back early and ended up a better than appears 7th after getting fanned very wide in the lane at Keeneland Oct 31. He exited the BC Juvenile with an eye ulcer, probably caused by flying dirt during the running of the race. He is wintering in Florida and returned to the work tab Dec 28. He retains his #4 ranking and I still like him as a long term prospect. Latest Workout: 5f bullet in :48 (1/76) at Palm Meadows on Dec 31. Comments: Visually impressive maiden win at Keeneland Oct 2. In the BC Juvenile, he chased the pace from the inside pace and faded to finish 8th. He bounced back with a solid stalk/pounce 2-length flat mile Optional Claiming win at Churchill Downs on Nov 28. He is wintering in Florida and remains at #5. Comments: $900k purchase battled with Mohaymen throughout and ended up 2nd in his debut. He was clearly second best as the favorite (beaten 1/2 length) in a 6f special weight sprint at Belmont Park Oct 28 on a muddy (sealed) racetrack. In a one mile straight maiden race at Aqueduct on Nov 22, he controlled the pace as the heavy favorite and won by nine lengths under hand urging. He stays put at #6. Comments: Beat Matt King Coal by a nose at 8.5f (Belmont Park, Oct 3) and was flattered when that one returned to win impressively four weeks later. He fought restraint in the Remsen and ended up an even 3rd in his first stakes try. He ends the year at #7. Latest Workout: 4f in :48.40 (27/110) at Santa Anita on Dec 27. Comments: Ran his record to 5-for-5 and wrapped up the 2-year-old title in the BC Juvenile. To his credit, he was farther back than usual and raced wide from post 13. He gamely held off Swipe for the fourth consecutive race but the final clocking was more than a second slower than filly counterpart Songbird once again. He still seems like a miler type but keeps on winning. At this stage he is in great shape in regards to Derby points and is expected to have two 2016 preps prior to the first Saturday in May. The deserving juvenile champ returned to the work tab Dec 19, moves up one spot, and is expected to make his 2016 debut in the G2 San Vicente Stakes at Santa Anita on February 15. The plan is to make his final Derby prep in the Florida Derby at Gulfstream. Comments: He did not run a complete race from start to finish and ended up an even 4th in the Champagne. He was last for much of the race and rallied for the show (missed 2nd by a neck) in the G2 Nashua. In the Remsen, he made a decent run from off the pace but flattened out and ended up 4th. He moves up one spot to #9. Latest Workout: 5f in 1:00 (6/39) at Santa Anita on Dec 28. Comments: Could not match strides with Toews On Ice in the Speakeasy (six furlongs) at Santa Anita Oct 18 but was clearly second best. He failed to threaten when 5th of 7 in the G3 Bob Hope (7f @ DMR on Nov 14), a race in which the top three dominated throughout (Toews On Ice, Mac Daddy Mac, I’malreadythere). I believe he will improve around two turns and hope he gets a chance to route in the near future. He finishes 2015 at #10. Comments: Owns two of the better juvenile speed figures this year in a clear place finish at 8.5 furlongs at Belmont Oct 3 (93 BSF) and a 96 BSF for his easy flat mile wire job maiden win at that same venue Oct 29. Following a respiratory infection, he spiked a fever and will miss the G3 Jerome on Jan 3. He will get a 4-6 week vacation on the farm. He drops to the bottom of the list. Undefeated Kiaran McLaughlin runner Mohaymen remains the most exciting Kentucky Derby 2016 prospect in the country after a convincing victory in the Grade 2 Remsen Stakes. Mohaymen has been the head honcho since I started my Derby list Sept 30 and the $2.2 million purchase is certainly living up to lofty expectations. The son of Tapit is growing up fast and is spending the winter in Florida. G2 Remsen (11-28-15, 96 BSF): Mohaymen ran his record to 3-for-3 with an easy 1-1/2 length victory over Flexibility. Gift Box was a clear 3rd and Sail Ahoy finished 4th. Mohaymen has been my top ranked Derby contender since I started my list on Sept 30 and he continues to improve for McLaughlin. G2 Kentucky Jockey Club (11-28-15, 87 BSF): Turf specialist Airoforce loved the wet track at Churchill Downs on Nov 28 and rallied outside to a clear win by 1.75 lengths. He must still prove himself on a fast dirt track for Casse but he is obviously a promising sort heading into 2016. Mor Spirit might have run the best race for Baffert. The latter shipped from SoCal, caught a wet track, did all of the pace dirty work, and gamely held the place over late runner Mo Tom. Stalker Gun Runner lost his punch and ended up 4th. Comments: The $2.2 million yearling purchase beat promising $900k purchase Seymourdini at six furlongs in his Belmont Park debut on 9-19-15 (87 BSF). In the G2 Nashua on Nov 4 at Aqueduct, he stalked wide, took a clear lead in the stretch, and won nicely by 1.75 lengths (89 BSF) under a hand drive. He wrapped up his juvenile campaign with an effortless stalk/pounce win by 1.5 lengths (96 BSF) in the G2 Remsen at Aqueduct on Nov 28. He retains the top spot. Latest Workout: 5f in 1:00.80 (13/43) at Santa Anita on Dec 9. Comments: $650k purchase had a slow start, made a nice inside middle move, took the lead, and ended up a clear 2nd (83 BSF) in his 6f Santa Anita debut Sept 27. He returned at a flat mile Oct 23 and cantered to an easy win (92 BSF) as the 1-2 favorite (geared down under Gary Stevens). He shipped to Churchill Downs and battled hard throughout in a good runner-up performance in the Kentucky Jockey Club Stakes on Nov 28. He stays put at #2. Comments: Owns two of the better juvenile speed figures this year in a clear place finish at 8.5 furlongs at Belmont Oct 3 (93 BSF) and a 96 BSF for his easy flat mile wire job maiden win at that same venue Oct 29. He is up one peg to #7. Comments: Beat Matt King Coal by a nose at 8.5f (Belmont Park, Oct 3) and was flattered when that one returned to win impressively four weeks later. He fought restraint in the Remsen and ended up an even 3rd in his first stakes try. He moves up a notch to #8. Comments: Ran his record to 5-for-5 and wrapped up the 2-year-old title in the BC Juvenile. To his credit, he was farther back than usual and raced wide from post 13. He gamely held off Swipe for the fourth consecutive race but the final clocking was more than a second slower than filly counterpart Songbird once again. He still seems like a miler type but keeps on winning. At this stage he is in great shape in regards to Derby points and is expected to have two 2016 preps prior to the first Saturday in May. The deserving juvenile champ moves up one position to #9. Comments: He did not run a complete race from start to finish and ended up an even 4th in the Champagne. He was last for much of the race and rallied for the show (missed 2nd by a neck) in the G2 Nashua. In the Remsen, he made a decent run from off the pace but flattened out and ended up 4th. He drops four spots from #6 to #10. Latest Workout: 4f in :48.80 (21/47) at Santa Anita on Dec 7. Comments: Could not match strides with Toews On Ice in the Speakeasy (six furlongs) at Santa Anita Oct 18 but was clearly second best. He failed to threaten when 5th of 7 in the G3 Bob Hope (7f @ DMR on Nov 14), a race in which the top three dominated throughout (Toews On Ice, Mac Daddy Mac, I’malreadythere). I believe he will improve around two turns and hope he gets a chance to route in the near future. He clings to the bottom of the list. The first Kentucky Derby 2016 Future Wager pool is open now through Sunday, November 29 and includes a sire wager for the first time. G3 Delta Jackpot (11-21-15, 92 BSF): The Jackpot is run on a tricky six furlong bullring in Louisiana and rarely has a big impact on the Derby. In this year’s renewal, strong favorite Exaggerator was content to stalk the pace but nobody really wanted the lead so Kent D was able to secure a short lead throughout on a muddy, sealed surface. G1 Champagne runner-up Sunny Ridge took up the chase after six furlongs and fell a neck short while well clear of show finisher Harlan Punch. The 1-2 Jackpot finishers are solid horses but seem a cut or two below the top juveniles in the country. Latest Workout: 5f in 1:01.12 (2/4) at Belmont Park on Nov 18. Comments: The $2.2 million yearling purchase was a determined 1/2 length winner (87 BSF) at six furlongs in his Belmont Park debut on 9-19-15. In the G2 Nashua on Nov 4 at Aqueduct, he stalked wide, took a clear lead in the stretch, and won nicely by 1.75 lengths (89 BSF) under a hand drive. He is entered in the G2 Remsen (race 5) at Aqueduct on Nov 28. He retains the top spot. Latest Workout: 6f in 1:16.20 (10/10) at Santa Anita Park on Nov 22. Comments: $650k purchase had a slow start, made a nice inside middle move, took the lead, and ended up a clear 2nd (83 BSF) in his 6f Santa Anita debut Sept 27. He returned at a flat mile Oct 23 and cantered to an easy win (92 BSF) as the 1-2 favorite (geared down under Gary Stevens). 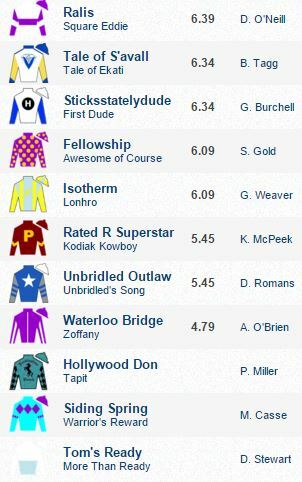 He is entered in the G2 Kentucky Jockey Club Stakes (race 11) at Churchill Downs on Nov 28. He stays put at #2. Comments: Looked great from off the pace in back-to-back wins at Churchill (one mile maiden win) and Keeneland (G1 Breeders’ Futurity). He worked his way through traffic to finish a decent 3rd in the BC Juvenile and continues to look like a solid stretch factor on the Derby trail. He moved up one notch to #3 last time and stays right there. Latest Workout: 4f bullet in :47.20 (1/68) at Churchill Downs on Nov 20. Comments: Visually impressive maiden win at Keeneland Oct 2. In the BC Juvenile, he chased the pace from the inside pace and faded to finish 8th. I thought the Juvenile might be a bit too much too soon, but he is still learning and remains a promising sort. 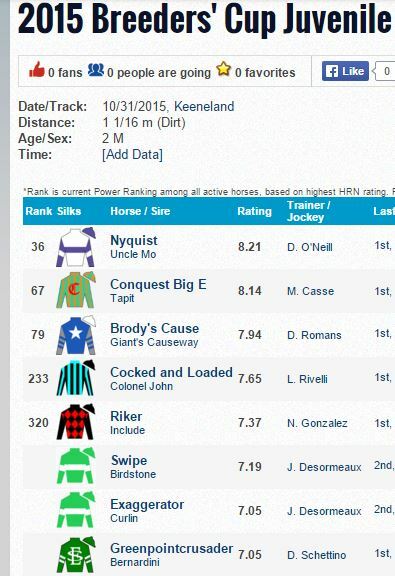 He is entered in a one mile Optional Claiming event (race 10) at Churchill Downs on Nov 28. He is still ranked #5. Latest Workout: 4f in :47.83 (6/62) at Belmont Park on Nov 22. Comments: He did not run a complete race from start to finish and ended up an even 4th in the Champagne. He was last for much of the race and rallied for the show (missed 2nd by a neck) in the G2 Nashua. As stated before, he figures to improve around two turns and should get better next year for patient trainer Shug McGaughey, who saddled Kentucky Derby winner Orb in 2013. He is entered in the G2 Remsen (race 5) at Aqueduct on Nov 28. He holds his #6 position. Comments: $900k purchase battled with Mohaymen throughout and ended up 2nd in his debut.He was clearly second best as the favorite (beaten 1/2 length) in a 6f special weight sprint at Belmont Park Oct 28 on a muddy (sealed) racetrack. In a one mile straight maiden race at Aqueduct on Nov 22, he controlled the pace as the heavy favorite and won by nine lengths under hand urging. He stays put at #7. Latest Workout: 5f in 1:03.06 (19/40) at Belmont Park (dirt training) on Nov 14. Comments: Owns two of the better juvenile speed figures this year in a clear place finish at 8.5 furlongs at Belmont Oct 3 (93 BSF) and a 96 BSF for his easy flat mile wire job maiden win at that same venue Oct 29. He remains at #8. Latest Workout: 5f breeze in 1:01.85 (13/35) at Belmont Park on Nov 14. Comments: Beat Matt King Coal by a nose at 8.5f (Belmont Park, Oct 3) and was flattered when that one returned to win impressively four weeks later. Also, the show finisher was another 18 lengths back Oct 3 so the top two were much the best. He is entered in the G2 Remsen (race 5) at Aqueduct on Nov 28. He stays at #9. Comments: Ran his record to 5-for-5 and wrapped up the 2-year-old title in the BC Juvenile. To his credit, he was farther back than usual and raced wide from post 13. He gamely held off Swipe for the fourth consecutive race but the final clocking was more than a second slower than filly counterpart Songbird once again. He still seems like a miler type but keeps on winning. At this stage he is in great shape in regards to Derby points and is expected to have two 2016 preps prior to the first Saturday in May. The deserving juvenile champ moves up on position to #10. The next Kentucky Derby 2016 points race is the Grade 3 Delta Jackpot on Saturday, November 21, and Breeders’ Cup Juvenile 4th place finisher Exaggerator is the 2-1 morning line favorite. Exaggerator is the only graded stakes winner in the Jackpot lineup and his class and positional speed should serve him well. G1 Champagne runner-up Sunny Ridge is a fresh threat for the productive Ortiz/Servis team. He projects an inner tactical journey. Found Money invades from Southern California for Doug O’Neill, who saddled Goldencents to win the 2012 Delta Jackpot. Forevamo won the local Jackpot prep in the slop and will try to get involved late from the rail under Colby Hernandez. The Jackpot field is completed by Memories of Winter, Whitmore, Harlan Punch, Texas Jambalaya, Cowboy Classic, and Iron Dome. Last Saturday at Del Mar, Toews On Ice won his third sprint stakes in the G3 Bob Hope (84 BSF), defeating promising second timer Mac Daddy Mac. The latter was clearly second best and is an interesting long range Derby prospect. Former exceptional eleven member I Will Score is back on the worktab for Jerry Hollendorfer. After a 30 day gap in his morning activity, he went 4f in :50.60 (31/33) at Santa Anita on Nov 7 and 4f in :48 (7/47) at that same venue on Nov 14. Comments: The $2.2 million yearling purchase was a determined 1/2 length winner (87 BSF) over Seymourdini at six furlongs in his Belmont Park debut on 9-19-15. In the G2 Nashua on Nov 4 at Aqueduct, he stalked wide, took a clear lead in the stretch, and won nicely by 1.75 lengths (89 BSF) under a hand drive. McLaughlin is looking at the G2 Remsen for his next start. He retains the top spot. Latest Workout: 6f in 1:13.16 (2/14) at Santa Anita Park on Nov 16. Comments: $650k purchase had a slow start, made a nice inside middle move, took the lead, and ended up a clear 2nd (83 BSF) in his 6f Santa Anita debut Sept 27. He returned at a flat mile Oct 23 and cantered to an easy win (92 BSF) as the 1-2 favorite (geared down under Gary Stevens). The G1 Los Al Futurity on Dec 19 would be a logical next step. He stays put at #2. Comments: Put it all together from off the pace in a strong 4-1/2 length victory in the Champagne. The BC Juvenile favorite was too far back early and ended up a better than appears 7th after getting fanned very wide in the lane at Keeneland Oct 31. He exited the BC Juvenile with an eye ulcer, probably caused by flying dirt during the running of the race. His connections are deciding whether to winter in New York or Florida and he will not run again this year. He retains his #4 ranking and I still like him as a long term prospect. I really like his pedigree and he figures to get better with age. Latest Workout: 4f bullet in :47.20 (1/68) at Churchill Downs on Nov 14. Comments: Visually impressive maiden win at Keeneland Oct 2. In the BC Juvenile, he chased the pace from the inside pace and faded to finish 8th. I thought the Juvenile might be a bit too much too soon, but he is still learning and remains a promising sort. His stablemate Airoforce is expected to contest the Kentucky Jockey Club Stakes so he might end up in a one mile allowance race at Churchill Downs on Nov 28. Latest Workout: 4f in :50.65 (46/51) at Belmont Park on Nov 15. Comments: He did not run a complete race from start to finish and ended up an even 4th in the Champagne. He was last for much of the race and rallied for the show (missed 2nd by a neck) in the G2 Nashua. As stated before, he figures to improve around two turns and should get better next year for patient trainer Shug McGaughey, who saddled Kentucky Derby winner Orb in 2013. He holds his #6 position. Comments: $900k purchase battled with Mohaymen throughout and ended up 2nd in his debut.He was clearly second best as the favorite (beaten 1/2 length) in a 6f special weight sprint at Belmont Park Oct 28 on a muddy (sealed) racetrack. He moves up one notch to #7. Comments: Owns two of the better juvenile speed figures this year in a clear place finish at 8.5 furlongs at Belmont Oct 3 (93 BSF) and a 96 BSF for his easy flat mile wire job maiden win at that same venue Oct 29. He made his debut at #9 on the list Nov 6 at is up one spot. Comments: Beat Matt King Coal by a nose at 8.5f (Belmont Park, Oct 3) and was flattered when that one returned to win impressively four weeks later. Also, the show finisher was another 18 lengths back Oct 3 so the top two were much the best. He was new to the list on Nov 6 and moves up one spot to #9. Comments: Could not match strides with Toews On Ice in the Speakeasy (six furlongs) at Santa Anita Oct 18 but was clearly second best. He failed to threaten when 5th of 7 in the G3 Bob Hope (7f @ DMR on Nov 14), a race in which the top three dominated throughout (Toews On Ice, Mac Daddy Mac, I’malreadythere). I believe he will improve around two turns and hope he gets a chance to route in the near future. He was #7 last time and drops four notches to #11. 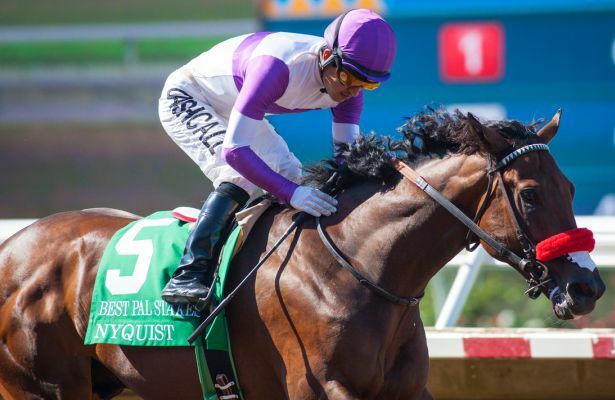 Early Kentucky Derby 2016 favorite Nyquist kept his perfect record intact with a 1/2 length score over Swipe in Saturday’s Breeders’ Cup Juvenile at Keeneland. 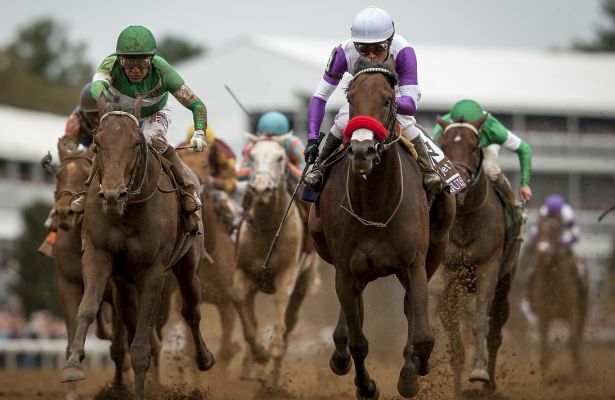 In a replay of the FrontRunner Stakes, Nyquist held off rival Swipe. The latter has now finished 2nd to his nemesis in four consecutive stakes races. BC Juvenile Fillies winner Songbird ran more than one second faster. For comparison purposes, she received a 99 BSF and Nyquist got an 89. It was the same speed figure gap at Santa Anita when she won the Chandelier and Nyquist took the FrontRunner. What does all of this mean in regards to Kentucky Derby 2016? The early evidence clearly suggests that the BC Juvenile horses are not on the same level as likely 2-year-old filly champ Songbird. Nyquist owns a win early pedigree tilted toward speed and there is a good chance that he will not improve as distances increase next year. Take nothing away from Nyquist. He is 5-for-5 and the deserving 2-year-old champ, but he does not look like a mile and a quarter horse on the track or pedigree-wise. It is important to keep an open mind, especially at this early stage, and he will have ample opportunities to prove he can go nine furlongs and beyond in 2016. Brody’s Cause was up for the show in the Juvenile and has always looked like a long winded type. Swipe’s stablemate Exaggerator ended up an even 4th and might have distance limitations. Ralis chased early and faded to 14th and last. The G1 Hopeful winner needs a rest after a busy campaign and should probably turn back in distance. He drops off the list. Due to workout inactivity, Justin Squared and I Will Score drop off the list as well. G1 BC Juvenile (10-31-15, 89 BSF): Southern California-based colts Nyquist and Swipe took their exacta show on the road and did their thing at Keeneland. Breaking from post 13, Nyquist was wide and further back than normal, but none of that mattered. He seized the lead in the lane and held off Swipe by a 1/2 length. The latter has better stamina breeding and might be able to turn the tables on his nemesis next year. Nyquist deserves the 2-year-old title but he is not dominating around two turns like he did in sprints. Brody’s Cause rallied through traffic to garner the show in a solid performance. Comments: The $2.2 million yearling purchase was a determined 1/2 length winner (87 BSF) at six furlongs in his Belmont Park debut on 9-19-15. In the G2 Nashua on Nov 4 at Aqueduct, he stalked wide, took a clear lead in the stretch, and won nicely by 1.75 lengths (89 BSF) under a hand drive. McLaughlin is looking at the G2 Remsen or G2 Kentucky Jockey Club Stakes for his next start. He retains the top spot. Latest Workout: 4f in :48 (9/35) at Santa Anita Park on Nov 3. Comments: $650k purchase had a slow start, made a nice inside middle move, took the lead, and ended up a clear 2nd (83 BSF) in his 6f Santa Anita debut Sept 27. He returned at a flat mile Oct 23 and cantered to an easy win (92 BSF) as the 1-2 favorite (geared down under Gary Stevens). He stays put at #2. Comments: Looked great from off the pace in back-to-back wins at Churchill (one mile maiden win) and Keeneland (G1 Breeders’ Futurity). He worked his way through traffic to finish a decent 3rd in the BC Juvenile and continues to look like a solid stretch factor on the Derby trail. He moves up one notch to #3. Comments: Put it all together from off the pace in a strong 4-1/2 length victory in the Champagne. I really like his pedigree and he figures to get better with age. The BC Juvenile favorite was too far back early and ended up a better than appears 7th after getting fanned very wide in the lane at Keeneland Oct 31. He exited the BC Juvenile with an eye ulcer, probably caused by flying dirt during the running of the race. His connections are deciding whether to winter in New York or Florida and he will not run again this year. He swaps positions with Brody’s Cause and I still like him as a long term prospect. Comments: Visually impressive maiden win at Keeneland Oct 2. In the BC Juvenile, he chased the pace from the inside pace and faded to finish 8th. I thought the Juvenile might be a bit too much too soon, but he is still learning and remains a promising sort. The Kentucky Jockey Club Stakes at Churchill Downs on Nov 28 might be next, and he could meet up with his stablemate, BC Juvenile Turf runner-up Airoforce. I will keep him at #5 and am expecting him to run better next time. Latest Workout: 5f in 1:00.60 (11/46) at Santa Anita Park on Nov 2. Comments: Could not match strides with Toews On Ice in the Speakeasy (six furlongs) at Santa Anita Oct 18 but was clearly second best. He seems to want more ground and remains a promising sort. He was #7 last time and stays right there. Comments: $900k purchase battled with Mohaymen throughout and ended up 2nd in his debut.He was clearly second best as the favorite (beaten 1/2 length) in a 6f special weight sprint at Belmont Park Oct 28 on a muddy (sealed) racetrack. With Ralis dropping off the list, he moves up one spot. Comments: Owns two of the better juvenile speed figures this year in a clear place finish at 8.5 furlongs at Belmont Oct 3 (93 BSF) and a 96 BSF for his easy flat mile wire job maiden win at that same venue Oct 29. He makes his debut on the list. Latest Workout: 5f breeze in 1:00.45 (2/13) at Belmont Park on Oct 31. Comments: Beat Matt King Coal by a nose at 8.5f (Belmont Park, Oct 3) and was flattered when that one returned to win impressively four weeks later. Also, the show finisher was another 18 lengths back Oct 3 so the top two were much the best. He’s new to the list. Comments: Ran his record to 5-for-5 and wrapped up the 2-year-old title in the BC Juvenile. To his credit, he was farther back than usual and raced wide from post 13. He gamely held off Swipe for the fourth consecutive race but the final clocking was more than a second slower than filly counterpart Songbird once again. He still seems like a miler type but keeps on winning. At this stage he is in great shape in regards to Derby points and is expected to have two 2016 preps prior to the first Saturday in May. The likely juvenile champ is new to the list and grabs the final spot in a very tight call over Swipe.